Which favourite views do you have in your lounge? Some people are fortunate, if they overlook wonderful scenery from their kitchen, lounge or bedroom windows. My previous marital home, overlooked the whole of Mumbles and Swansea Bay. You could see as far as Ilfracombe on a clear day! Now the seafront is on my doorstep! Writing my reply to Dean about his fab “trip and trek” to the Beacons I wanted to ask you “Which favourite views do you have in your lounge?” Maybe some of you have pictures of places you still wish to visit?. That’s my next task. Here is one of mine for “starters” – a pressie from my daughter and son in law, in thanks for all the weekly treks, I enjoy with her KC Spaniel, Louis. Close your eyes for a moment and relax to the sound of the sea. Main course then dessert anyone?? Who inspires you? Just watched the impossible done ….again. Posted in Business, Fitness, Health, Musings, Social, Wellbeing | Comments Off on Who inspires you? Just watched the impossible done ….again. Dr. Das posted this thread last week ‘Your local gym, usually seen as a Mecca of health and wellness, might just be a ticking time bomb of personal injury! If you’re not careful, one small missed step on a treadmill can land you in the emergency room. Great gymnasium common sense tips from Tara Zimliki, founder of Tara ‘s Bootcamp and Ace certified. You have to be a recognised qualified fitness professional in the UK to join, I know, as I joined Fitness Professionals and Idea in 1990. Dangerous Distractions at the Gym. If you are reading and watching sky television use the commercial breaks to pump up the revs re spinning and interval training. 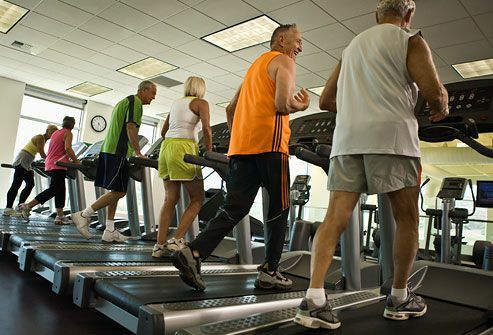 Falling off treadmills and cardio ellyptical trainers can happen if you lose concentration. Texting or calling someone in the middle of a cardio workout is dangerous. Wait until you have finished and have a break. Getting the wires caught up in the equipment dangerous so tuck them into your sweat tops or arm pouch pockets. 1. Go swimming three to four times a week, if you can swim that is?? 2. If you are unable to swim take lessons!! 3. If you have a phobia of water get professional hypnotherapy help! 4. If you really hate water (some do) try cycling along coastal pathways taking in fresh “clean air” away from polluted roads and motorways. Cycling along sea coastal routes the best with good sensible clothing and saftey advice. 5.Try Yoga and Tai Chi as another alternative. It’s excellent for elongating tense muscles and building harmony into your day. 6. There you go ….. you don’t even have to enter a gymnasium, unless you live so far from rivers, cycle tracks or the sea. You can still Power it with sensible footwear, clothing, drink still water and get good safety advice. Happy Monday! What are you looking forward to this week? Online for a good hour ‘spring cleaning’ my contact list, files and reading e-mails. Palm Sunday was catching up with that ‘hour change’ having celebrated a special ecumenical service, with a mixed (different) bunch from our community, as our City Church is home for all, the homeless, the sick, the disadvantaged, the learning difficulties ‘side by side’ with dignitaries. Special for me, as my late father followed the ecumenical faith up until his death in Malta in 1997. My decision to contribute to blogs over the ‘in celebration of a new birth’ days led me to focus on the most sparkling upbeat and ‘not so’ upbeat blogs. It still amazes me as to the categories of constant downbeat replies, that flag up in the middle of the most ‘incredible supporting fund raising ideas’ like..
Dean ‘Way of the Warrior’ Man to link him up with Ben. As I gear up for my week ahead – this week being ‘a little’ special for me, it’s that time of year to celebrate new life and my son will be flying home from training with the ‘dawn to midnight’ runs. I can’t wait to have my belated Mother’s day and special hug day all rolled ‘in one’ by a cheeky chappie, who despite his huge responsibilities is the most fun ‘full of life’ son I could wish to have. Thank you Thomas, Penny and team for giving birth to a wonderful platform known as ecademy. You are currently browsing the Lifestyle Online blog archives for April, 2010.